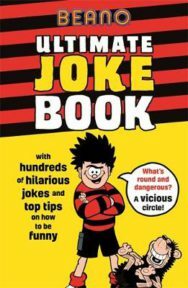 A hilarious joke book filled with the best jokes from the Beano comic book. From rib-tickling knock-knock jokes to hysterical Doctor, Doctor gags and everything in between, this book has a joke for every occasion.As well as the side-splitting jokes, split into handy categories, this book contains the secrets to becoming a top comedian. With lessons from the Beano Joke Academy, budding comedians can learn how to create their own comic persona, deliver one-liners and even write their own gags.